This Memorial is located in a Chapel which, according to accounts, was initially established on this site in 792AD by Eanbald, Archbishop of York and Aethelbert, Bishop of Hexham and dedicated to the ‘Blessed Virgin Mary’. The land on which Smithills Hall stands has been owned by, amongst others, Roger de Poictou, the Knights Templars, Richard de Hulton, and William de Radcliffe who built the current medieval hall (originally entirely timber framed) in the 14th Century. Numerous families have loved and maintained the buildings through the generations. In 1801, the hall and estate were sold for £21,000 to the Ainsworth family, who were successful Bolton bleachers. Under three generations of Ainsworths, Smithills was extensively rebuilt and modernised. The Bolton Journal reports “This Memorial was unveiled and dedicated by Colonel Ainsworth and Rev. W. S. Standen before a large congregation, the ancient chapel being crowded almost to excess”. Changes in the British economy after the First World War had increased costs and reduced the amount of income the family could raise from the estate, and the financial burden of maintaining a large house eventually became too great. In 1938 Bolton Corporation purchased the Hall and estate for £70,000, which including the Chapel. The Chapel was rededicated on the 18th December 1957 twenty years after its closure. The Chapel was reopened at this dedication ceremony performed by the Lord Bishop of Hulme. Today worship in the Chapel takes place on the third Sunday of the month. The Friends of Smithills Hall introduced a simple annual Remembrance Service in the Chapel, starting in 2014, which included the laying of a wreath to commemorate those on the Memorial and others who had served this country during the 1914-18 War. At some unknown date after 1921 the panels on the Memorial were changed to their present form shown below. There were three panels on the original Memorial headed (Left) Those who fought and Returned (Centre) Those Who Fell (Right) Those Who Fought and Returned. The left panel had 13 names, the middle 10 names and the right 13 names. The changes made were removing the two Ainsworth relatives from the list of fallen in the centre column and creating a new column on the left and moving the two Ainsworth relatives who served and returned onto the newly created right panel. Although there appears to be no recorded reason for the changes it is apparent from comparing the two memorials that the spelling of one of the fallen was incorrect. ‘James Arthur Longwith’ should have read ‘James Arthur Longworth’. However the compiler still managed to incorrectly change ‘Arthur’ to ‘Albert’. The left and right panels are Ainsworth relatives living outside Bolton whilst all the rest of those named are local to Bolton. Background research to each of those men named is recorded in Memorial Books placed near the Memorial in the Chapel, for public information. 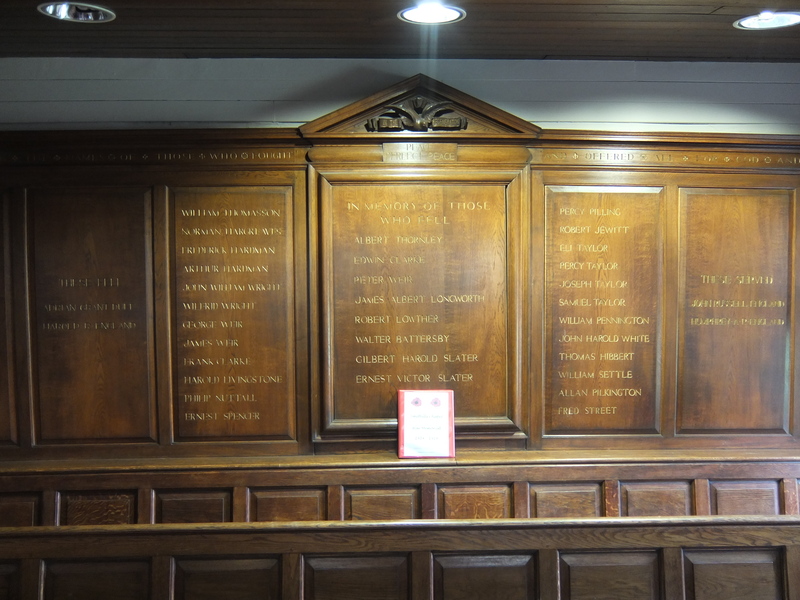 All those ‘Who Fell’ are recorded on the Bolton Roll of Honour held in the Bolton Town Hall together with their regiments and service numbers. A copy of the research has been deposited at Bolton History Centre. A link to the research is available on the Friends of Smithills Hall webpage. I am the editor of the Bolton Family History Society newsletter the Boltons Genies and am planning to put this information into our next newsletter due out early December. Please may I use the photo on your site of the War Memorial.